As I’m sure you know, every 10 years the Federal government updates its records through a comprehensive Census. Well, NCP does something similar, but we do it every year to make sure we have the most up-to-date information about our panel members. And, yes, it’s time for the annual Demographic Update Survey! If you haven’t responded yet, please check your Surveys page at ncponline.com and answer the survey as soon as possible. You’ll earn 500 gift points for just a few minutes of your time. One of the reasons we collect all of this (updated) information is that we use it to help develop reports for manufacturers and retailers. It’s important for them to know what households like yours with similar demographics or in a similar geographic region are purchasing. 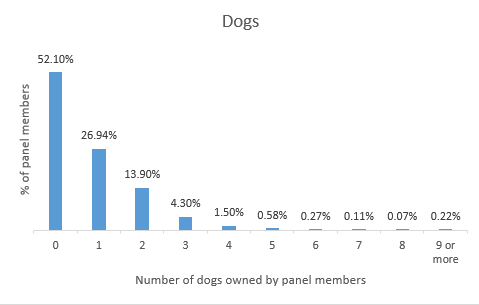 For instance, if a client wanted to know how much dog food someone with three or more dogs purchases, we’d be able to provide that information. Do you have a cute picture of your cat or dog that you’d like to share? If so, send the photo to news@ncppanel.com and we’ll try to post it here on the blog in the coming weeks. 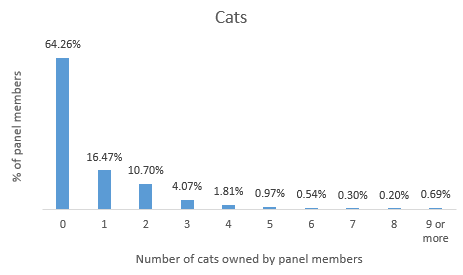 So remember to take the Demographic Update Survey. Thanks, and have a great weekend! I had to pick up a prescription yesterday after work at the CVS pharmacy located inside my local Target. On my way home, I wondered if panelists knew exactly how to record their own purchases in this situation. Here’s what you should know: Even though it is branded as CVS, any purchase made at these counters should still be reported as a Target shopping trip. Please make sure you choose the correct Target store option in your scanner or the NCPMobile App. Any trip to a CVS pharmacy that is NOT located within a Target should continue to be reported as CVS. Check out our YouTube video on this very subject! While we’re on the subject of drugstore purchases, the next time you make a purchase at a (stand-alone) CVS, Rite Aid, Walgreens or any other drugstore retailer, please remember to report that shopping trip to us. As I’m sure you know, drugstores sell a wide range of products, not just prescriptions. For instance, you can pick up greeting cards, over-the-counter medications, skin care, baby needs, snacks, candy, magazines, and a whole lot more. Whenever I pick up a prescription at a drugstore, I NEVER leave without buying something else – most often, I have to be honest, a candy bar or two! Retailers and manufacturers need your complete shopping information to help them make important marketing decisions. While these may be quick trips and may include items that potentially do not make it home (such as a pack of gum or a candy bar), they are just as important as your large grocery and discount store trips. Are there any things related to scanning that you find confusing? If so, let me know and I’ll be happy to address them. Note: As of this writing, Hurricane Irma was making its way toward Florida. We hope all who may be impacted will be safe. No matter where you live, I’m sure school is back in session. I don’t know about you, but I’m pretty happy about it! I’ve been so busy getting my kids ready to go to school that I hadn’t had time to write about it here. If you purchased a lot of school supplies and food/snacks, as well as apparel and items for your child’s dorm room, I hope you were able to scan what you bought. If you forgot, it’s not too late to do so! How much do you typically spend? Let me know! Right now, my big concern is making sure the kids have healthy lunches and snacks. According to The Nielsen Company, when it comes to fruits and vegetables, in the five weeks (in 2016) around back-to-school time apples were the top-selling produce item with $243.5 million in sales. Strawberries and fresh cut fruit weren’t far behind, with sales of $202.8 million and $204.9 million, respectively. 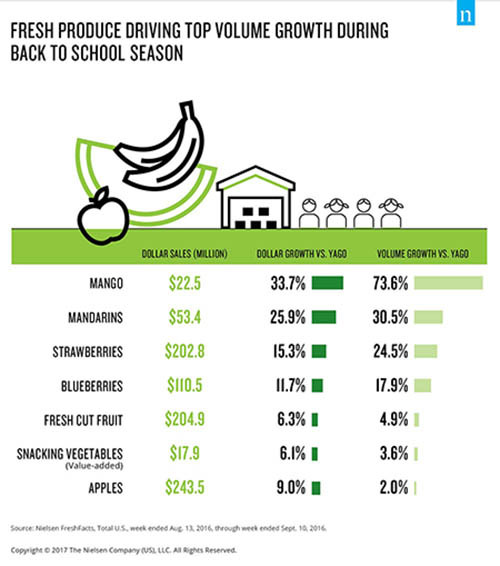 But it’s mangoes that drove the most sales growth in the back-to-school season. From 2015 to 2016, mango sales in the five weeks around back-to-school grew more than 73%, topping sales of $22.5 million. In case you’re wondering, sales of other snack items, which may not be so healthy – but who’s judging! – also increase during the five-week back-to-school period. So, if you have kids, what do you give them for lunch or a snack? Tell me all about it! I hope you all have a nice weekend. For those impacted by Hurricane Harvey, or potentially by Hurricane Irma, stay safe.